Dogs love cheese as much as they love chasing squirrels. So they’re sure to fall head over tail for these unique treats! 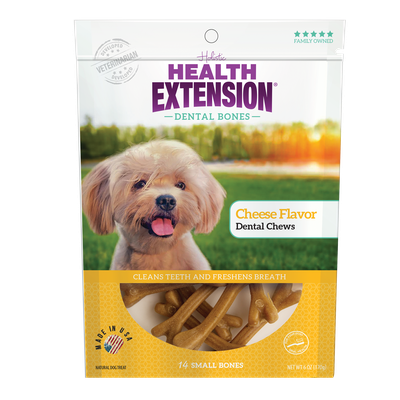 Our Cheese Flavor Dental Bones are formulated with kelp and parsley to naturally freshen breath, while their special texture helps scrub plaque away with every bite. Plus, these super-tasty bones are packed with antioxidants, vitamins, minerals and essential amino acids like all Health Extension pet foods and treats. Potato flour, rice flour, vegetable glycerin, potato starch, natural flavor, sunflower meal, chia seed, flaxseed oil, dried kelp, canola oil, dried cheese, lecithin, glycerin, citric acid(preservative), rosemary extract.